England's warmest/coldest months on record: By the end of today, a weather record which has stood since 1729 should have fallen. With an average temperature exceeding 16½°C, this month looks set to be the warmest September ever recorded in the UK. That's according to the official list of Monthly Mean Central England Temperatures - a meteorological dataset stretching back nearly 450 years. The table below shows the warmest and coldest months recorded across Central England since 1659. These are based on the average temperatures over an entire month, including overnight, which is why the highs may not look especially high and the lows may not look especially low. But they are. And the figures are highly illuminating. We've not broken a coldest monthly temperature record in the UK for more than 50 years, and the majority of these have stood for two centuries or more. But five of the warmest months on record have occurred in the last 12 years, and two of these in 2006. Global warming anybody? Update: Even after a slightly cooler end to the month, the final average temperature for September 2006 is an exceptionally mild 16.8°C (beating the record set in 1729 by 0.2°C). There's a new sight on the ever-fascinating streets of Tower Hamlets. Not litter bins, because we've had those for ages, but the big yellow stars recently slapped upon them. Tower Hamlets' bins are squat, black and boring, and are therefore very easily overlooked by passers by. Heaven knows how many local pedestrians have carelessly discarded an empty can or burger wrapper onto the pavement simply because they weren't able to spot a nearby bin quickly enough. They don't have this problem nextdoor in Hackney where the bins are bright green [photo], nor in Newham where all the bins are an intrusive shade of scary pink [photo]. But that won't work here. It would cost Tower Hamlets council far too much to replace all of their bins using a vibrant shade of rainbow plastic. Never mind, because a big luminous star-shaped sticker does the job just as effectively. This new campaign has provided maximum impact for minimum outlay. The stellar shape is smart without being tacky, and eye-catching without being over-intrusive. It's now easy to spot a star-stickered bin even from a long way off, as you can see here [photo]. No East End pavement need ever again be scattered with crisp packets, London Lites and chicken wings. It may have taken a month of Saturdays, but the Tower Hamlets Street Management Committee have finally got something right. My apologies that yesterday's posts were of limited interest to a global audience. If you've not been watching BBC2 on Thursday evenings recently (which would be 99.9% of the world's population) then these two posts will have been utterly meaningless. I apologise. I should never assume that everybody will understand all of my UK-based cultural references. My blog needs to be accessible to all of my readers, no matter where they happen to live. My writing must never be inappropriately exclusive. So I've decided that I'm going to write less, and to use explanatory footnotes as appropriate. It's essential to be inclusive (il est essentiel d'être inclus) (es ist wesentlich, einschließlich zu sein) (es esencial ser inclusivo). Rest assured that this is not in any way dumbing down. It's just how the world works these days. I read yesterday that the Hamster1 is on the mend. Well hurrah for that. 1 "The Hamster" is the nickname of Richard Hammond2. 2 Richard Hammond is one of the presenters of Top Gear3. 3 Top Gear is a BBC24 series in which middle-aged men test drive cars you can't afford whilst slagging off all other forms of transport. 4 BBC2 is a British television5 channel which we've already established you almost certainly don't watch. 5 Television is a 20th century telecommunication system for broadcasting and receiving moving pictures and sound over a distance. The tube1 was very crowded last night. I had to stand all the way home. 1 The tube is another name for the London's Underground2 railway. 2 Most of the Underground isn't under the ground, but the first section3 was underground and so the name stuck. 3 London's first underground railway ran between Paddington4a and Farringdon4b. 4a Paddington is a big station, not a little bear. 4b Farringdon is a district of Central London on the northwest edge of the City5. 5 The majority of the world's population will never visit Farringdon and don't give a damn6 about the place. This morning I'm going to see my NHS1 dentist2 for a check-up3. It's her last day before she goes private4. I hope I don't have to come back for a filling5. 1 The National Health Service is a quaint British institution which is meant to offer poor and rich people the same level of medical treatment. 2 A dentist is state-appointed sadist in a white coat. 3 A check-up is five minutes of tooth-poking during which you get to stare intimately up the nostrils of a caring health professional. 4 Private dentistry is the same as NHS dentistry, only ten times more expensive and with a tooth-whitening option. 5 Damn the government's insane dental reforms. A new scourge is stalking the internet. You start to load a webpage in your browser... and you wait... and you wait... and you wait... and eventually the page loads. And then you notice why you've been waiting. Somewhere on the page is a colourful animation, probably (but not necessarily) rectangular in shape. You can't miss it - it's moving around, trying gleefully to attract your attention. It might not be an advert, but it probably is. Somebody else has made you wait, and wasted your time, in an attempt to sell you something you almost certainly don't want. It's not the end of the world if it happens once. But it is bloody annoying when it happens again and again <taps fingers> and again on page after page after page. Actually it's an old scourge. Advertisers have been trying to screw the surfing public with inappropriate methods of online promotion for years. Like those horrific pop-up ads which used to appear out of nowhere whenever you clicked on certain webpages. You'd think "hmmm, why isn't this page loading?" and then, eventually, an evil flashing box would appear. If you were lucky you just got the one, but sometimes the more you tried to shut them down the more boxes tried to appear. Thankfully the emergence of pop-up blocker browser software means this online irritation is now pretty much a plague of the past. And then advertisers worked out that you couldn't shut down their adverts if these were embedded in the webpage itself. So adverts started appearing above, beside and even in the middle of the content you were trying to read. First there were text adverts, like the ones I sneaked into this page yesterday. These were closely followed by image-based adverts, colourful and ubiquitous. And most recently we've been assaulted by dynamic Flash-based adverts, each far more intrusive and taking far longer to download. Advertisers are taking advantage of our increasing broadband speeds and continue to deliver as much "exciting visual content" as they think our system can take. Heaven help anybody today still struggling along on dial-up. I don't see why my surfing experience should be impaired merely for the material gain of others. Sure adverts may be an integral part of the internet, but they shouldn't be allowed to dominate or even hijack my browser time. And it's not just adverts. Many webmasters insist on including embedded videos (oh please no) or music players (why oh why) or complicated Java-based widgets (oh how much longer must I wait?) which do little more than unintentionally annoy their audience. It's either thoughtless or selfish, and it's quite possibly both. So I just wanted to laugh and say that I've managed to banish the majority of this visual spam from my computer. Hurrah for the Firefox browser, and its repertoire of cunning add-ons. Using the Adblock extension I can block a wide range of image-based adverts so that they need never appear on my screen again. Where you see a promotion from ad.doubleclick.net or pagead2.googlesyndication.com, I see a blank space or even no space at all. I no longer suffer from image-based advertisements intruding around or within online text - I just view pages the way they used to look in the good old days. It's brilliant. And the Flashblock extension is even better. Ever since I installed it I've had no trouble whatsoever from annoying animations trying to load before I can read a webpage. In their place appear small arrowed buttons which I can choose to press or, more likely, choose to ignore. No Flash loads on my computer without my express permission. Hurrah! I'm in charge of my browsing experience once again, and it feels good... at least until some advertiser introduces something even more intrusive which I can't block. Like those damned annoying low-tech text ads. Thank goodness hardly anybody uses those any more. OK, I'll stop! That's quite enough Christmas stuff for now. But you know I could have kept it up for another 13 weeks. Be very afraid. And very relieved. I've been thrilled and excited by your reaction to my yuletide makeover. It seems I've stumbled upon a previously unclaimed blogland niche, and that's strategic marketing nirvana! I'll soon have advertisers queueing up to promote their hand-knitted stockings, food hampers and personalised gift labels - all essential purchases at this very special time of year. So, as Christmas continues to loom ever closer on the horizon, it's on with my seasonal tips, festive hints and words of urgent advice. O come, all ye faithful!!! If like me you're a Londoner who finds it hard to resist the allure of Christmas shopping, you'll be delighted to hear that it's now possible to indulge your retail obsession all year round. Imagine my delight recently to discover an exclusive emporium close to London Bridge station devoted entirely to the sale of quality festive products. The Christmas Shop at Hay's Galleria is an Aladdin's Cave of yuletide essentials, from half-size Santas to pet-friendly crackers, and from glitter-dipped snowflakes to acrylic nativity treetrim. With personal service here never less than exemplary, SE1's shoppers are a-buzz with seasonal excitement. 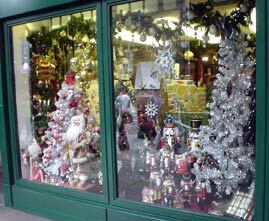 Meanwhile, on the other side of town, grateful shoppers are already flocking to Harrods' Christmas World department. This collection of quality decorations and top-notch gifts never fails to excite even the most exclusive shopper. Nobody could resist a green-jacketed Alexander bear or a toy-soldier shaped nutcracker, each an assured Christmas essential. And no child will ever forget the magic of a Father Christmas Breakfast Experience in the Georgian restaurant, not once you've forked out £35 for the privilege. Who said money can't buy you love? Let's not forget the humble Advent Calendar! Extended beyond Christmas to the New Year, for no religious reasons whatsoever, and packed behind each window with lovely artificial chocolate substitute in tiny low-carb bites. Yum. Advent may officially begin in December, but this year why not buy yourself an extra calendar and countdown to Advent throughout November. Or, even better, buy yourself another extra calendar and countdown to counting down to Advent throughout October. Triple the ancipation, triple the fun! The big unanswered mystery of Christmas is no longer "how did God's love manifest itself through Immaculate Conception?" but "will the Xbox 360 be ready for shipping in sufficient quantities by December?" Modern children expect nothing less than electronic consumer perfection, so it pays to establish their heartfelt retail desires with an early autumn trip round Hamleys. Top sellers this Christmas are expected to include anorexic dolls, Balamory SumoWarriors (batteries not included) and Jamie Oliver liposuction kits. Don't be a Scrooge with the kids this year, give 'em what they so justly deserve. Cover the front of your house with flashing fairy lights. 100% non-tacky. Delight your friends with one of our bleepy Christmas Carol ringtones. Because that's the point, isn't it? Not all of this rampant consumerism. Pah! Creme Eggs are back soon!! Hold tight now and it'll soon be the pre-Easter season again. Bring it on! Why spend Christmas sat on a centrally-heated sofa watching the Queen's Speech when you could spend it on a tropical beach watching the sun set? You can avoid rampant commercialism at home by exploiting the poverty-stricken culture of some far distant non-Christian shanty town. Quick, before world leaders ban all non-essential global travel and you're forced to spend next Christmas on the sofa. With just three months to go until Christmas, no doubt your thoughts have already turned to preparing for the festive season. So much to do, so little time. Gifts to buy, parties to plan, food to prepare, sparkly decorations to purchase... the list goes on and on. So I've decided that now is the perfect time to reposition my blog to take full advantage of upcoming yuletide monetization opportunities. 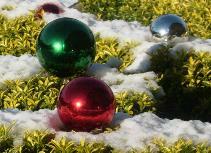 I'm on a new mission to bring you the very latest Christmas hints, tips and gossip, right here on my rebranded webpage. It's going to be festive-tastic. Have yourself a merry little Christmas!!! Do you have relatives in Uganda, New Zealand or the Pitcairn Islands? If so then time is already running out if you want to send them a Christmas gift this year. The last posting date for surface mail to these territories, and to many other countries outside of Europe, is coming up as early as next week! If that bijou hand-crafted ceramic vase isn't gift-wrapped and down at the Post Office by Monday 2nd October, there's no guarantee it'll arrive at its destination in time to grace a far-flung Christmas dinner table. Sure you could send it by airmail in December, but who wants to fritter away hard-earned money on wasteful luxuries? It pays to be prepared!  Mince pies still have great novelty value at this time of year. You've not had one for months, so slip a packet into your trolley and give yourself a treat. A fruit-packed mince pie makes a great healthy addition to any child's school lunchbox too. Just keep an eye on the sell-by-date, and make sure you eat the whole of this first batch by the end of October.  It won't be long now before your local store stops selling cheap bags of peanuts and fills its shelves instead with vastly overpriced plastic tubs of cashews. Act quickly and you might be able to stock up on value bags of nuts while stocks last... and what's more your December party guests will never spot the difference!  What child wouldn't love to wake up on Christmas morning with a Cadbury's chocolate variety selection tucked into their stocking? How fantastic, then, that they're already available to purchase three months in advance. Store them carefully at the back of your wardrobe (and not in the airing cupboard) and there's every expectation that the Crunchie won't have melted and the Dairy Milk won't have gone a bit furry before each finally gets unwrapped. If you're married, or even just coupled, it won't be long now before senior members of both families are in touch demanding to know in whose presence you'll be spending Christmas. Will you spend the big day with your folks, or with theirs? Choose wrongly and your relationship could easily implode during three months of pre-yuletide social stress. Never mind that other people's families are always crashing bores with no social skills whatsoever, they still always expect you to be there while they unwrap homemade jumpers, drink sherry and go to bed early. And don't think you can compromise by agreeing to visit on Boxing Day instead, because that's a gross social snub and will never be forgiven. The only equitable solution is to plan ahead and have kids of your own. Both sets of doting grandparents will then immediately insist on coming to see you every Christmas, even if there's no room to stay overnight because the spare room is now a nursery, and all arguments will cease. Cover your lawn in tiny polystyrene chippings. 100% convincing, honest. Get this crazy sound and ride with the frog each time you get a call! We'll be round on Boxing Day to take away all your unwanted gifts. There's no finer Christmas gift than a calendar. What better expression of your deep respect than to give somebody you love a few sheets of stapled paper emblazoned with glossy photographs of landscapes, popstars or kittens. Even better, 2007 calendars usually come with an extra 4 months upfront free, which means you could have been using a new model since September 1st. Excellent news, particularly if Shayne Ward is currently splashed across your 2006 calendar and you'd like to upgrade him as soon as possible for somebody with rather more zeitgeist. I've been keeping an eye on the street signs down Bow Road for the last couple of months and, in particular, following the actions of the Tower Hamlets Pointless Streetsign Erection Committee. They've been busy ripping down some of E3's older street nameplates and replacing them with modern accessibility-compliant white rectangles. This street sign at the end of Mornington Grove [photo] is their latest target... and about time too. It's stuck to an old wall opposite the local Magistrates Court, a few metres down from Bow Road tube station. The sign looks like an MDF offcut wedged inexpertly into a grimy brick frame, with a wafer-thin layer of white plastic slapped on top. The lettering wasn't so much designed as stencilled, with several of the characters rather too close together and others not quite properly aligned. The faded Tower Hamlets logo in the top left corner is now barely visible, and the surface is peeling in ugly random patches. The whole thing has the look of a temporary street sign which has somehow outlasted its expected shelf life. But no longer. The Tower Hamlets Pointless Streetsign Erection Committee has inspected this wall and found it wanting. The old sign didn't meet stringent inclusivity guidelines and has therefore been removed, to be replaced by one of the council's ultra-new 21st century designs. The new lettering's a bit spindly, and the gleaming white background probably won't survive a winter of lager abuse without creaming up a bit, but it's a big improvement on the old 70s atrocity. And this signage upgrade has had a rather wonderful side-effect. An original mid 19th century street sign has been magically revealed from its hiding place, and it's a bit of a masterpiece [photo]. Look at that expert chisel work - every character chipped to perfection and not a letter out of place. The surrounding brickwork may now be cracking up, but there's still more craftsmanship on display here than on all the other street signs down Bow Road put together. A shame then that the 150-year-old sign has had to be painted black in an attempt to obscure its heritage features from the eyes of passers-by, because time has moved on since this wall was first erected. 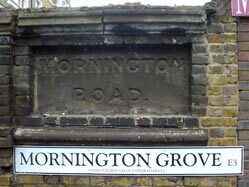 Mornington Road has somehow become Mornington Grove, a name change probably enforced by the Tower Hamlets Post-war Street Renaming Committee. The new name hints at a rural lane between orchards and smallholdings, which is what the road used to be, and not a poky backwater street where locals now dump unwanted sofas. The old carved sign may be lovely, but post-war street renaming means it's also outdated, misleading and extinct. I bet it won't be too long before some officious workman comes along and boards over it again, blocking it from view, because councils have "an obligation" not to mislead the travelling public. Which would be a great shame, because this is a rare streetscape jewel in an age of increasingly bland conformity. Life, nightlife, the sense of history, the Underground, canalside strolls, the view from Greenwich Park, the fact there's always somewhere new to discover, cutting-edge architecture, classical architecture, Oxford Street, the chimes of Big Ben, nightbuses, world cinema, world cuisine, the world in a city, the 2012 Olympics, the sunlight on the Thames, buying your Sunday paper on Saturday evening, the museums in South Kensington, the museums that aren't in South Kensington, not needing a car, the wobbly Millennium bridge, being able to choose from more than two local radio stations, suburbia, Tate Modern, the view from Hampstead Heath, diversity, acceptance, mind the gap, six of Arsenal's Premiership away matches being nearly at home, strolling along the South Bank, Waterloo sunset, festivals, Trafalgar Square, knowing that you could walk to Trafalgar Square but not having to, piles of arty stuff, 100% style, the top pod on the London Eye, St Pancras station, decent mobile phone reception, free newspapers, cab drivers, memories embedded in every streetscape, Routemasters, blue plaques, global landmarks, taking a shortcut down a back street you've never walked down before, realising that Dr Johnson was right, watching the dawn over Tower Bridge,the forgotten corner of a Victorian cemetery, the West End, the East End, 24 hour bagel shops, culture on your doorstep, Banksy on your wall, deckchairs in Green Park, the Embankment illuminated, eyeballing a famous person in the street, the DLR, 0° longitude, the City, parklife, the view from Primrose Hill, far less fog than everyone imagines, snow on terraced rooftops, Covent Garden, the view from the front seat on the top deck of a bus, alleys, tunnels, being out at 4am, the Gherkin, decent record shops, Soho, pie and mash, street markets, speeding down the river beneath world famous bridges, garden squares, Oyster, always having something to do even when it's raining, urban wildlife, St Paul's Cathedral, walking faster than the traffic, following in Roman footsteps, New Johnston font, crossing Westminster Bridge at night on the back of a bike, the variety of Theatreland, just a short dash to the country, the British Museum, the anonymity of not knowing your neighbours, collective consciousness, common ground, the fact it's not as scary as out-of-towners think it is, Metro-land, moquette, deserted Thames-side beaches, the buzz, infinite choice, the city's constant resilience, feeling alive, just living here. I sold my car five years ago today. I drove down to my local garage at lunchtime, handed over my car keys in exchange for a fat cheque, and waved goodbye to the world of driving. It felt good, at least until I realised I now had to walk the two miles back to the office. I sold my car five years ago. It was my first and only car, and I'd had it for just a couple of years. It had four wheels and an engine, and it was blue. I'd only bought it because I had to, because it was a requirement of the job I'd been doing. But this was my last day in the job, and I wasn't sorry to see it go. I sold my car five years ago. I was living in a Suffolk village at the time. The village had only five buses a day, at times more useful to pensioners than commuters. The local shop was a tiny post office which sold sellotape and 7th birthday cards but not milk or bread. The nearest supermarket was too far away to reach on foot, along rat-run country lanes I'd never risk walking along. Without a car I'd have been isolated and starving hungry. I sold my car five years ago. I gave up the opportunity to drive wherever I wanted whenever I wanted. I ceased hurling myself along fast rural roads in a fragile metal box. I abandoned my private bubble kitted out with blaring hi-fi and a glove compartment full of barley sugars. I willingly surrendered my independence, speed and comfort. I sold my car five years ago. I stopped having to fork out hundreds of pounds annually on petrol, and hundreds more pounds on insurance, and hundreds more pounds on servicing and repairs. I stopped having to hunt for an appropriate parking space, and risking extortionate fines if I couldn't find one. I had to start paying to use public transport again, but overall I saved an absolute fortune. I sold my car five years ago. Nobody thanked me for my selfless action. Nobody gave me a certificate honouring the reduction in my carbon footprint. Nobody cheered when I stopped clogging up roads with three empty seats everywhere I went. No passing car drivers flashed their headlamps at me in deference to my greener lifestyle. I sold my car five years ago. I recognise that this was only possible because I moved from Ruralsville to BigCity. But now I live somewhere where not having a car is the norm, and where sitting next to people on buses isn't sniffed at. I may have less freedom than before, but I also have less hassle and more money. Being car-free has made my life more carefree. And, I have to say, I wouldn't have it any other way. All of the following sponsored surveys have clogged up the UK media over the last week. Motor Insurer's Bureau Black people are more likely than white people to be charged with possessing cannabis, a police study has found. Metropolitan Police More than nine out of 10 12-year-olds in the UK now have a mobile phone, a survey has suggested. Carphone Warehouse Britons worry about so-called yob culture far more than violent crime, vandalism or burglary, a survey says. Nine out of 10 retailers believe shop crime is low on the government's agenda, according to a new survey. 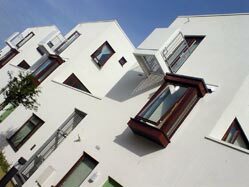 British Retail Consortium Homes in the north of England are more energy efficient than those in the South, a survey has revealed. British Gas The long-term decline in church congregations has been slowed by people from ethnic minorities, a survey says. Christian Research The most dedicated football fans spend nearly £100,000 following their team during a lifetime, a survey suggests. Hundreds of thousands of people are failing to maintain mortgage payments and risk losing their homes, according to a national charity. Citizen's Advice Households in the UK would recycle more waste if it was easier to understand what rubbish can and cannot be recycled, a survey has suggested. City & Guilds Mothers who began their successful businesses at home are becoming a "powerful force" in British industry, a survey suggests. Yellow Pages More than one third of children with attention deficit hyperactivity disorder have been excluded from school, a survey of parents suggests. Caithness has emerged as a stronghold for the water vole, according to the results of a survey. Scottish Natural Heritage The average Briton feels that they need a retirement income of nearly £30,000 a year to live comfortably. Scottish Widows Six out of 10 children buy a McDonalds Happy Meal at least once a month, a survey reveals. Weight Concern Gloucester is the cheapest city in the UK for cocaine, crack cocaine and cannabis, according to a charity. 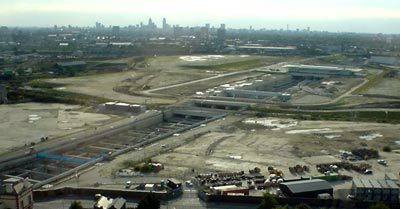 One final irresistable visit as part of London Open House was the opportunity to survey the 2012 Olympic site from above. A special viewing suite has been established on top of Holden Point, a 21 storey tower block in deepest Stratford. The portakabin on the roof is somewhere warm to take VIPs and and engineers when they need an overview of the Olympic Park (and it's a lot cheaper than hiring a helicopter). Various members of the IOC have been up here, as has Chancellor Gordon Brown, and even the Queen paid a visit last year. I rather like the fact that Her Majesty has been to a very ordinary yellow council block in the East End and travelled up to the 21st floor in a slightly-too-small lift, just like many of her loyal subjects suffer every day. I spent an hour on the roof of Newham, looking out across the future. Directly in front of me was the new Stratford International railway station, cut deep in a broad trench running across reclaimed marshland. Eurostar trains will be speeding through here next year, but they won't be stopping for a while because there's nothing surrounding the station shell but a single road and acres of dirt. This dirt will one day be the new Stratford City development, an upmarket office/retail/residential complex (in direct contrast to the existing Poundstretcher/kebab/Woolworths shopping centre to the south). The true Olympic site lay rather further away, somewhere in the middle distance, which was a shame because that made it much harder to see. When the Queen was up here they helped her out by tying big coloured balloons to existing buildings to represent various Olympic proto-stadia. I had to make do with a pair of binoculars and a small map. As well as enjoying the view out of the window, my group was also informed and entertained by the Olympic Delivery Authority's Head of Stakeholder Engagement. Thankfully his personality was a lot more engaging than his job title. Richard explained, with the aid of a malfunctioning DVD and various maps, how the scene below us would be transformed over the next five years. We're in the middle of a two year planning stage at the moment, which ends next summer when the bulldozers arrive. In July next year, it was confirmed, a big security fence will go up round the perimeter of the site and public access will be closed off. If you want to walk the green spaces of the Lower Lea Valley, or if you're the heron I saw stalking the Pudding Mill River at the weekend, the months are running out. We spent too much of our hour above Stratford looking in rather than looking out. Maybe that's because there's not yet very much to see apart from the station, no major building work of any great consequence. But in five years time the view from this window will include a Waitrose, an Aquatics Centre and an Olympic Stadium. Within ten years, as the legacy phase kicks in, these should be joined by a giant waterpark and hundreds of acres of affordable housing. The Newham council representatives I met up Holden Point probably still can't believe their luck... just so long as the Olympic Delivery Authority actually delivers. On a good day from up here you can already see the Wembley Arch on the horizon. Let's hope it acts as a wake-up call and not an omen. As part of the Open Site programme, members of the public were yesterday permitted rare access behind the scenes at the capital's largest white elephant. This was a unique opportunity to glimpse beneath the Teflon-coated roof before the site reopens next year as an entertainment arena, and was therefore a must-visit for devotees of failed government projects. 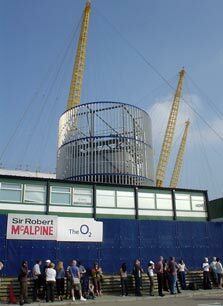 It was strange to see queues again outside the Dome... almost as strange as it would have been to see them when the place was open. The Open House brochure had promised a "hard-hat tour", but what we got instead was a walk up to the entrance and back with questions answered inbetween. The first thing we saw was the new piazza between the Dome and the tube station, still being laid out with finest granite. On the far side a "Living Wall" was being constructed... which is a bit rich given that the old Millennium Experience had its own Living Wall on the opposite side of the site which has since been left to decay. This new square was a reminder that the tip of the peninsula is now on its second revamp in under a decade, and has had more millions of pounds thrown at it than almost any other spot in the capital. Still, it'll all be worth it next July when you can come here for a cappucino and a cutting edge pop concert. Standing just under the rim of Lord Rogers' big tent, we were able to peer into the gloom to where several new buildings are under construction. A curved wall straight ahead shields the new central arena (no trapeze artists this time). To the left is a metal shell which will one day house a casino (eventually, even if Greenwich doesn't win the upcoming super casino licence). To the right is a 10 screen cinema, then a live music venue, and between them a street the length and width of Bond Street. Or there will be. The buildings are merely bricks and steel at the moment, at least from the outside, and there was no hint that any single interior was any nearer completion. Still, I'm sure that the new post-Millennium Experience will open bang on schedule, with a complete range of exciting entertainment opportunities. Because London needs more bars and restaurants. And because nothing on this site has ever been known to fail. Severndroog Castle [photos]: Hidden amidst the trees on Shooters Hill is a three-cornered brick tower, erected in 1784 in honour of a reformed pirate. William James lived a daring and successful life on the high seas off India, returning home a successful and wealthy man, only to drop dead on the evening of his daughter's wedding. His wife Lady James was understandably distraught, and had this quirky belvedere built to honour his greatest naval success. The volunteers at Severndroog can tell you this story in much greater detail, probably whilst wielding a jangly bucket. By the time you've been round the tower to see what all the fuss is about, you'll probably want to throw a few coins in it yourself. 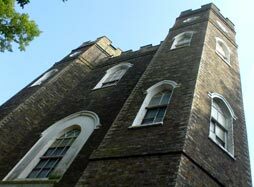 Severndroog Castle is an endangered structure, not through imminent collapse but through political disinterest. Up until 1986 there was a tearoom inside, plus ready access to the roof for an entrance fee of a few pence. And then Maggie dismantled the GLC, and the tower reverted to the control of Greenwich Council. They couldn't afford to maintain the cafe, which rapidly closed, and (more recently) they've tried to sell the tower off as offices. Thankfully a group of volunteers sprang up, peddled their restoration plans on the BBC's Restoration, and the future now looks a little more promising. Admittance is still only possible on this one weekend every year, but this quirky building is worth the effort of a visit. There's an unexpectedly ornate ceiling on the first floor, beneath which Lady James would mourn her late husband, and it's hoped that this room will one day become a space for public meetings. But the finest views are to be had from the roof, from the top of the western turret, where we were permitted precisely five minutes to gaze out across South London. On a good day you can see seven counties, so we were told. I'd recommend visiting this charming folly before the surrounding trees grow so high that you can only see one. More than five hundred architecturally interesting buildings have been open to the public for free across London this weekend as part of London Open House. Yesterday I managed to visit 1% of them. 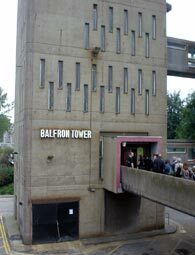 Balfron Tower: West London's Trellick Tower has a less famous older brother on the other side of the capital, just north of the Blackwall Tunnel. Both have a similar silhouette, both were designed by Erno Goldfinger, and both are admired from the outside by people who'd never dream of living on the inside. The architect himself was an exception. 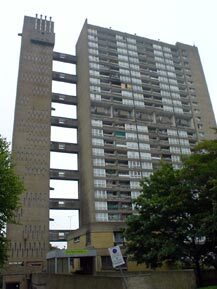 Goldfinger and his wife moved into the Balfron Tower soon after it was built, and spent a couple of months living in flat 130 on the top floor to find out what living here was like. This weekend, as part of Open House, Londoners have the chance to take a look inside a flat just along the corridor. Residents of the Balfron Tower were eyeing up the growing queue outside their front door yesterday morning with a certain degree of bafflement. What were these middle-class arty types doing here on a council estate in Poplar, and why were they willing to wait for hours to get inside. But this building is something special, a brutalist architectural masterwork with a highly original construction. I was lucky enough to be in the first small group of the day to gain entrance. The lifts to the top floor were malfunctioning so we could only ride up as far as the 18th floor before having to climb the remaining six storeys via the staircase. All the stairs and liftshafts are housed in a separate tower, joined to the main apartment block by a series of concrete bridges. We crossed the toppermost connecting walkway, our precarious mid-air state mostly shielded from view, and proceeded along to our target flat. The owner was pleased to show us around, although he may not be quite so keen by the time the umpteenth group traipses round his living space this afternoon. He's only just moved in and is one of the block's rarer upwardly mobile residents. His flat is fairly compact, and very white, with some tasteful Erno-designed features which elevate this above the usual tower block interior. Best of all, however, were the views... or at least they would have been had London not been cursed by low grey cloud yesterday, obscuring the horizon in all directions. Curses. Canary Wharf was near enough to be obvious, as was a large swathe of East London, but the Gherkin was just a ghostly shape in the distant mist. I can definitely see the attraction of living up here inside a design classic, if only for the opportunity to stare out across the capital with a broad smile. But the tortuous journey back down to civilisation convinced me that maybe I'm better off where I am. Bromley Hall: One of the joys of Open House weekend is discovering unexpected architectural treats on your doorstep. Bromley Hall looks like a very ordinary building beside the Blackwall Tunnel Approach Road, and I must have been past it scores of times without giving it a second look, but at its heart is the oldest brick house in London. In 1485 this was a hunting lodge with royal connections, located at the tidal limit of the River Lea. Later it became home to a series of successful merchants, each of whom made their mark on the structure and design of the building. The architect responsible for the hall's restoration, Paul Latham, was only too pleased to be able to show eager members of the public around inside his pet project. He knows every inch of the property inside out, from the old woodstained floorboards to the scrap of painted 17th century dado rail in the hallway. Particularly impressive are the patchy remains of a Tudor wall painting of a soldier wielding a crossbow, and a preserved wooden doorway carved with hunting scenes. With so many historical periods represented side-by-side, you get a real sense of domestic architectural evolution. 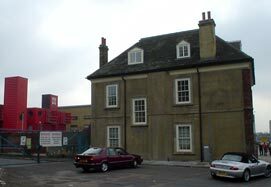 I'm particularly astonished that Bromley Hall survived the 20th century, during which time it was damaged by wartime bombs, a passing motorway and bolted-on advertising hoardings, as well as (most recently) its use as a garage store and a carpet warehouse. All praise then to Leaside Regeneration for the sensitive way they've converted the building back to office space... although it would be tough to choose between working here or inside the pile of red containers stacked up nextdoor. 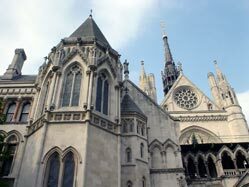 Royal Courts of Justice: If you're particularly naughty you might one day end up here, inside the big gothic building at the top of Fleet Street. The RCJ is the top civil court in the land (with the exception of the House of Lords) and also the criminal Court of Appeal. And until yesterday I'd never quite appreciated from the outside how vast it is inside - a labyrinth of corridors, chambers and court rooms arranged around a long high vaulted hall. The building's open to the public every weekday, but yesterday there were special tours allowing us to tour behind the scenes. It was fascinating to prowl the back corridors and to hear more about the courts and their 8000 staff from some of those who work here. There was even the opportunity to go down into the cells of the Court of Appeal and follow in the footsteps of the country's more famous miscreants. I can now claim to have stood in the VIP holding cell, sat in the back of a 12-seater prison van, and even been taken up to the accused's bench in a dark and dusty courtroom via the back stairs. And next time the Lord Chief Justice gets a mention in the news I'll be able to picture his airy book-lined court room without having to rely on one of those awful artist's impressions.  Marx Memorial Library (Clerkenwell): The repository of all things left-ish, including an upper room where Lenin spent a year writing. If you should ever need to refer to a copy of the United Mine Workers Journal (or similar) for research purposes, they'll have it in the basement.  More London (beside City Hall): A new Foster-designed office block overlooking the Thames, with two separate nine-storey wings joined by vertigo-inducing bridges across a central atrium. And filled by a bunch of accountants. Airport quiz: What is this modern obsession with naming airports after people rather than places? Nobody wants to fly to a dead person's airport, they want to fly to a readily identifiable city or region. But no, civic officials insist on naming airports after local statesmen and celebrities, even if nobody else then has a clue where these airports are. Maybe it's a way to confuse passengers, reduce air traffic and thereby cut carbon emissions. Or maybe it's just self-obsessed madness. Anyway, can you identify which major towns and cities are served by the following re-designated airports? There's a choice of three each time. Answers are in the comments box, but have a go before you peek. Local news for local people: Bow Road (that's the road, not the station) is due to be semi-closed for resurfacing work starting at 8am this morning. And every weekend from now until the end of October. And overnight every night (7pm-5am) until the first Friday in November. Ouch. The affected section is between Mile End and Bow Church stations, with eastbound traffic particularly badly affected. The promised contra-flow and local diversions should snarl up road traffic (and especially bendy buses) for miles around. I'm predicting chaos. Rarely does a week go by without some poor unfortunate group of rail travellers ending up trapped on their trains, often for hours at a time, as a result of some sudden and unforeseen circumstance. Sometimes it's signal failure, sometimes it's track failure, sometimes it's engine failure, and sometimes it's a suicide sparked by perceived lifestyle failure. Whatever the case, if you're unfortunate enough to be on a train which gets stuck somewhere outside a station, you and several hundred fellow commuters could be out of circulation for hours. Some rail travellers live in fear of being trapped on a train. What if they get stuck for an hour or more? What if they miss their connection? What if the bloke sitting next to them turns out to be a nutter? What if they get stuck for two hours or more? What if they miss their flight? What if all the lights go out? What if they get stuck for the rest of the evening? What if everyone in the carriage runs out of food? What if the train never moves again and life on board evolves into a primitive civilisation revolving around cannibalism and sudoku? I fear none of the above. If my train is ever halted between stations, there's very little that I can do except put up with the enforced quarantine. But I do fear one particular consequence of being trapped on a tube train, and that's to be stuck underground with a full bladder. Imagine the hideous social faux pas which might occur were the delay to continue for too long. A normal tube journey's no problem, even if I've been out drinking beforehand, because I know relief is never too far away. But if my train ever stops in a tunnel for what looks like forever, merely crossing my legs might not ultimately be sufficient. Given sufficient time that mild inner sensation will become a growing feeling, which can develop into a increasing need, which can build into an definite urge, which can escalate into an urgent compulsion, which can mutate into an unstoppable reflex action. Let's say no more about the incontravertible visual and olfactory evidence which might then emerge. In a confined space such as a rail carriage, surrounded by complete strangers with no means of escape, this could be very embarrassing indeed. And this I fear. So I'd like to offer my own advice to all rail travellers, in direct contradiction to TfL's usual line. Don't take a bottle of water with you on the tube, it can only make a bad situation worse. Instead, always use the facilities provided - be it at home, at the station, at your place of work or in the pub - before embarking on any train journey. Because it pays to travel empty. And then it won't matter how long your journey might be delayed - you need never fear the consequences of inconvenience. "Sometimes I feel I've got to run away, I've got to get away from the pain that you drive into the heart of me. The love we share seems to go nowhere." "Ridicule is nothing to be scared of, don't you ever, don't you ever stop being dandy, showing me you're handsome." "I am the one in ten, even though I don't exist. Nobody knows me even though I'm always there - a statistic, a reminder of a world that doesn't care"
"...clap ...pluck ...clap ...puff ...clap ...scrape ...clap ...screech"
Heaven 17 - Play To Win: While the Human League were basking in adoration at the top of the chart, their former bandmates - the half more likely to succeed - could do no better than number 46. Heaven 17's album Penthouse and Pavement foresaw (and suitably lambasted) the imminent yuppification of City life, and should have been huge but wasn't. The band had taken their name from a fictional Top Ten chart displayed in a record shop in the film A Clockwork Orange... and therefore narrowly missed being called Johnny Zhivago, Cyclops or even Googly Gogol. "Suit the movement to the word, reverse and check the action, play to win!" ...and then there was my favourite record of all time. Of which, more next month when it reaches the Top Ten. "Every time I think of you I know we have to meet"
15 other hits from 25 years ago: Endless Love (Diana Ross and Lionel Richie), Wired For Sound (Cliff Richard), Start Me Up (Rolling Stones), The Thin Wall (Ultravox), Abacab (Genesis), Everybody Salsa (Modern Romance), Souvenir (Orchestral Manoeuvres In The Dark), Hands Up Give Me Your Heart (Ottawan), Slow Hand (Pointer Sisters), Pretend (Alvin Stardust), In And Out Of Love (Imagination), So This Is Romance (Linx), She's Got Claws (Gary Numan), You'll Never Know (Hi Gloss), Europe After The Rain (John Foxx) ...which hit's your favourite? ...which one would you pick? I can't be bothered to save the planet. Because it's too much effort, isn't it? I know there are lots of things I should be doing to protect our environment for future generations, but somehow I never quite get round to doing them. Sorry. Apologise to your grandchildren for me, won't you? I did try slightly at the weekend when I visited the Mayor's Future London exhibition at the Truman Brewery in Brick Lane. It took a while to find the astro-turfed entrance round the rear of the building, but I was soon wandering around the vast whitewashed first floor, curtained off into a series of interconnected spaces. Several of the displays spread their content rather thinly, but the emphasis stayed the right side of preaching throughout. And everywhere, questions. Why don't you compost your rubbish? Why don't you buy locally-produced food? Why don't you try car-sharing? All the messages seemed very worthy at the time, but there were rather too many to remember and so I left not quite signed up to anything in particular. If the other 7 million Londoners are like me, the capital is doomed. So, with the aid of the the free leaflet that accompanies the exhibition, I've decided to shame myself into revealing 10 of the things I'm not doing to save the planet. But I have an excuse for each, see if I don't. They're damned good excuses too. And all highly valid, I'm sure you'll agree. 1) Leave no appliance on standby: Look, I do at least switch off my TV overnight, so it's usually only on standby during the evening. I would turn off my hi-fi when I'm not using it but I'd have to walk across the room to reach the switch. And surely I don't have to unplug my mobile phone charger for the 164 hours a week when it's not being used - it can't be using up much power if any can it? 2) Use low energy lighting: But I have perfectly functioning ordinary light bulbs thanks. Maybe I'll upgrade them when each one blows. Although the energy saving bulbs are a lot more expensive aren't they? I know they save more in the long term, but it never feels like a good deal up front. 3) Reduce your flush: At the exhibition I picked up one of those magic bags of chemicals that you're supposed to drop into your cistern where it inflates and reduces capacity. Except, well, you know, sometimes even normal capacity isn't quite enough to flush away everything, is it? So if I reduced my flush, I'd surely end up having to reflush more often, and that would be wasteful. 4) Turn off the tap when you brush your teeth: I know I ought to do that, but it's so much hassle isn't it? Because you can't brush your teeth with the tap off, can you? It has to be on at the beginning, and you have to turn it back on again to rinse, and again and again to re-rinse. It's all too impractical (or just too much effort). 5) Recycle your rubbish: My local council is one of the worst in the country at encouraging recycling. If they have any plans for doorstep collections, nobody's informed me about them. There are some communal recycling bins a few minutes walk away, but every time I turn up with a pile of newspapers I find the bin's already full to overflowing. So what's the point? 6) Eat organic: I'm sure it would be much better for me to eat knobbly vegetables and genetically unmodified fruit, and better for the over-fertilised environment too. But it costs far more than normal processed food. And it tastes odd (which probably means it tastes 'real', but I'm not used to real). And to buy it you have to travel miles to yuppie-infested farmers' markets and haggle with bearded ladies. And nobody yet sells organic KitKats. 7) Reduce your food miles: Yes, I know that my last meal probably travelled the equivalent of five times round the globe to reach my plate, destroying the atmosphere in a fog of carbon, but until they print "Food Miles" on the front of every ready-meal I refuse to waste time in the supermarket using an atlas and a ruler. 8) Grow your own food: There's not enough space on my balcony to grow root vegetables or trail a strawberry plant, even if I wanted to. And my balcony never gets any sun anyway. Although I am now self-sufficient in bay leaves, for all the good that does me. 9) Cycle everywhere: I'm sorry, but even though cycling might be good for my general fitness, in London it's also verging on the suicidal. What's the point in having rippling thigh muscles if you're lying underneath the wheels of a bendy bus? 10) Buy a hybrid fuel car: Except who in London needs a car? I haven't got one. I take public transport everywhere, and I walk a lot. And I keep my thermostat down low, and I never boil too much water in my kettle, and I try not to buy so much food I have to throw half of it away. So maybe I'm not doing too badly after all. Hell, who am I kidding? Sorry.